A Liberal's Libretto: Soprano Danielle de Niese - the untold story. 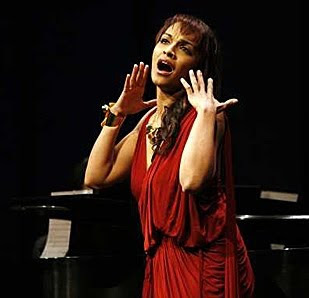 Soprano Danielle de Niese - the untold story. At the Salzburg Festival, the heaving bosom of a traditional, generously proportioned opera diva has been replaced by slim waists and scanty outfits. The streets and shop windows of the Austrian city are papered with posters celebrating the svelte figures of international stars who have flown in to sing. And three of them together would fit inside the voluminous costumes once worn by great singers such as [Dame] Joan Sutherland and Montserrat Caballé. Now, I will admit that I did get my feathers ruffled by this comment - saying in part: "If de Niese wants to discuss unprofessional behavior, perhaps she should re-think being associated with an article that prejoratively applies today's whispy standards to the operatic greats of the past." Anyone who has hung around and read this blog on a regular basis knows that the act of applying today's whispy standards to operatic greats of the past, and sometimes present, has been sending me into orbit from day one. Well - needless to say, friends - Ms. de Niese was not pleased. I received a comment which read: "This quote from Ms. de Niese is a MISQUOTE-- stay tuned. dd"
I'm not going to lie to you. I was sucked in and wanted more. In the interest of allowing Ms. de Niese to elaborate, and to get the true dish, I commented in return and also asked in subsequent posts for her response. After all, if she was misquoted, it needed to be straightened out. A friend sent this link to me. Though I have been advised against a response, I feel I must, under the circumstances. This quote has travelled over the wires from an article in the British Observer- I have never done an interview with the writer of this article nor was I ever interviewed by the Observer for this article. The quote originated from an Italian writer and appears to have taken on a life of its own. I have never described my colleagues in this way and those words are NOT my view. I also NEVER commented on Angela Georghiu whom I know personally. Words like those quoted are a wholly inaccurate and acute misrepresentation of my views and feelings. I myself have to work hard to manage my weight on a daily basis, and I would never make such a judgemental comment about singers. Those who know me personally know that first hand. I have great respect for singers of the past and present, and I work with many of them. I believe that body size is completely irrelevant if you have something to say as an artist both musically and dramatically. I've given interviews all my life- I have never taken to criticising or judging any of my colleagues. I try to live my life with only positive energy and I try to bring that into my work and performance because I feel very passionate about music. PS- you don't have to post this if you prefer not to. Now first of all, how could I NOT post this? I practically begged for a response. Not post it? Please. Second, I'd like to thank Ms. de Niese for taking the time to comment. A response to inaccurate reporting such as this is not only important, but very necessary. Especially if your personal views are distorted - as Ms. de Niese's seem to have been. Finally, It takes a very classy and genuine person to stand up and respond to this kind of reporting in an above-the-fray manner. Doing so, as she has here, shows that Ms. de Niese is indeed both classy and genuine. That is truly nice to know. A true professional. This might just be, in part, what caused the New York Times to call her Opera's Coolest Soprano. Classy on all fronts. Thanks for this great post. I worked in the Met Archives when Miss de Niese was in the Young Artists Program there, and thought her one of the nicest as well as prettiest creatures on the stage (though they were all nice). I'd advise her to ignore mis-quotes - they're just a sign that she's become notable. Joan Sutherland was once quoted as saying "I love to play those looney dames," and though she denied it, she could never get free of it. The truth is, an editor probably rewrote the original line, and the Italian journalist "quoting" de Niese would want to make anything overheard sound "more colorful." De Niese is far too professional to have said any such thing. But it is always mortifying to be misquoted.